Just so you know right from the start...nothing shown in this post costs more than 75 cents...you know that's an awesome sale...but they're only good until February 14, 2012. It's no secret that I love the designs from Twin Stitchers. I've used them in many of my faux embroidery projects. What you may not know is that Coley of Twin Stitchers, also has an amazing Digital Design site called Digi-Doodle Doo with some amazing digital scrapbooking packs. And right now she's having an AMAZING sale where most things on her site are less than $1. ALL elements, extras are on sale for only 25 cents! ALL paper packs are on sale for only 25 cents! 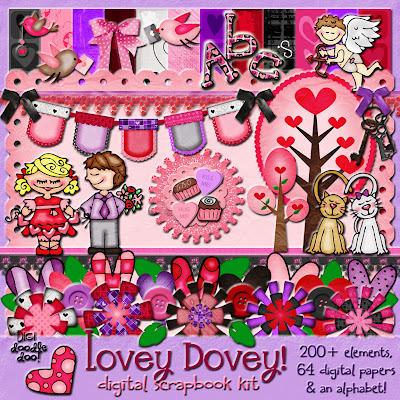 And all digi-scrap kits are on sale for only 50 cents! AND all MEGA bundles are on sale for only 75 cents! If you're a digital scrapbooker, you've probably stopped reading and are already over browsing all the Digi-Doodle Doo Mega bundles. Click HERE to get yours for only 50 cents! Click HERE to get yours for only 75 cents! If you're NOT a big digital scrapbooker--which I'm not--you'll still want to head over and check out Coley's designs because you can do pretty much everything with them that you can with her regular embroidery designs from Twin Stitchers...except they're so much easier to resize and customize. 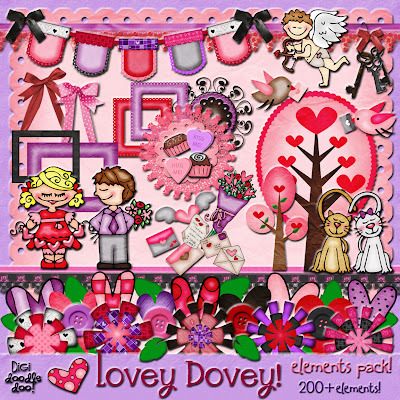 The Lovey Dovey Word Art and/or Elements Pack would make some awesome faux embroidery...and seriously...they're ONLY 25 CENTS EACH. Click HERE to get yours for only 25 cents! And even though it seems like the entire craft blogging world is flooded with red and pink Valentine's goodness, you might be ready to think ahead to the rest of the year and warmer weather, so here are a few of my other favorites that are also on sale. Have a little princess at your house? This Princess Play Elements Pack is on sale for 25 cents. Or maybe your princess is more like Fancy Nancy and love everything French...You might want to pick up this "All About Moi" kit for 50 cents. My mom would love anything made with this Happy Camper kit, available for 50 cents. And I love a lot of elements in this All American Summer Kit (available for 50 cents), but I think my favorite are those American heros (fireman, police man, and service man) tucked in there. And I know we just had Christmas. There was SO much Christmas stuff all over the blogs that it might be a little hard to think about it right now...I always love anything Nativity Themed for Christmas, so I love this Adore Him! Bonus Bundle and you're not going to find a cheaper price than 50 cents on something like this. And one last thing as long as we're on the subject of Christmas...I love these "Christmas Time!" Printable Tags and Labels...and they're only 25 cents. Hurry over and check out all of Coley's amazing designs because these prices are only good until February 14, 2012. Ooh, I'm not a digital scrapbooker in the least, but I'm still going over to browse and pick up the nativity set :) Thanks!